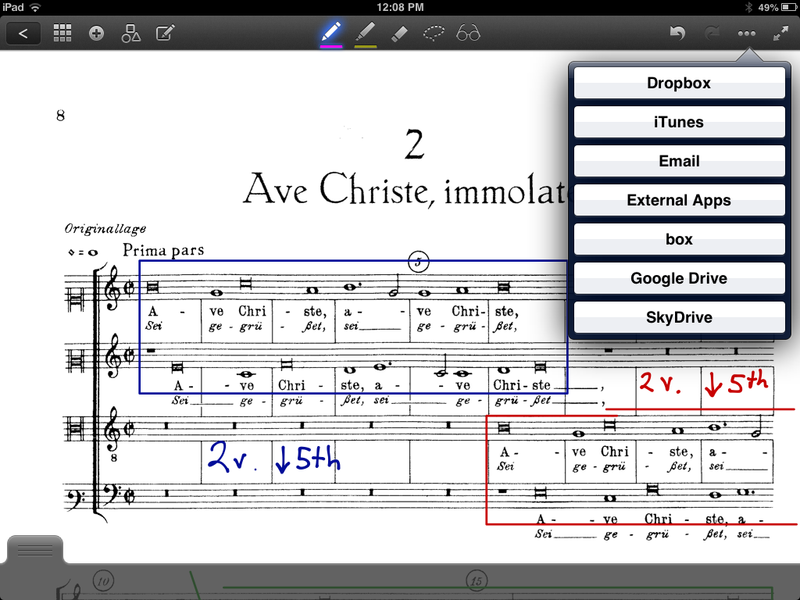 There are several annotation apps available for iPad, including iAnnotate and Penultimate, but Goodnotes has been my favorite so far for the music classroom, particularly for score analysis. The functionality of Goodnotes across multiple platforms and the ease with which scores and annotations are imported and exported provides ample opportunities for making analysis more interactive in the flipped environment. For students and classrooms with easy access to mobile technology, Goodnotes is a low-cost solution to expanding textbook resources quickly and efficiently. I often introduce peer analysis activities to encourage students to think beyond the isolated examples of the course anthology. Most music history textbooks, for example, include Josquin’s motet “Ave Maria…virgo serena” to illustrate the new compositional techniques of the Franco-Flemish school circa 1500 CE, namely those described by Pietro Aron in Toscanello in musica (Venice, 1523/rev. 1539). The most striking of these features include the pervasive “points of imitation,” paired voices, and homophonic textures, which reflects a sensitivity to text setting achieved by composing all voices at once (vertically) instead of in linear stages. Simulating the stages of composition and text setting with an activity facilitated by Goodnotes helps students solidify concepts from the book and anthology and reflect on the conditions for composition, performance, and dissemination. After discussing “Ave Maria virgo serena,” teams of students are assigned a different motet by Josquin to analyze and present to the class. Goodnotes facilitates teamwork outside of class by its compatibility with a variety of applications, Dropbox, Evernote, Google Drive, to name a few. Individual students can work with a specific color to represent their contribution with the file-sharing capabilities of the external programs. 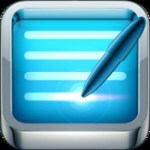 One advantage of Goodnotes is its compatibility with Safari on the iPad, which permits students to seek and acquire examples using their own judgment rather than relying of the instructor to provide. 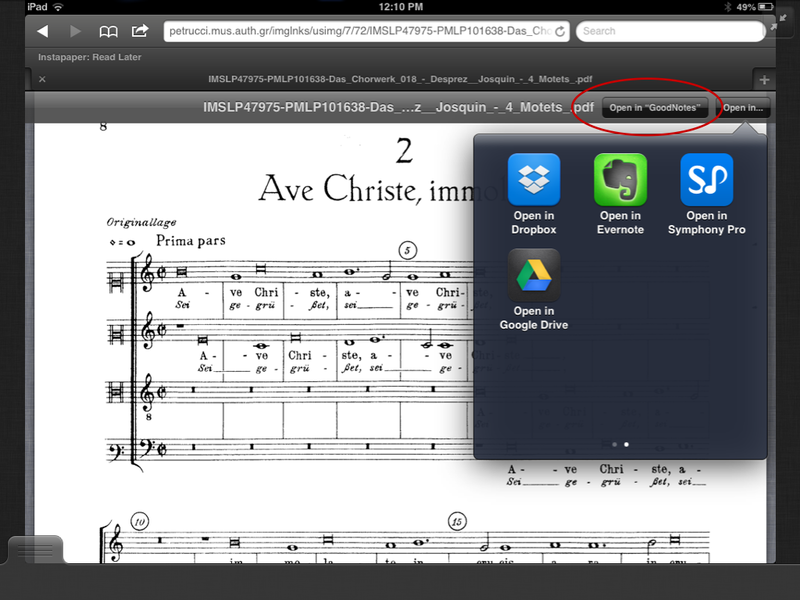 Note in the second screen shot that the Safari app provides a box for opening .PDF files from web resources directly into Goodnotes, like the International Music Score Library Project. The Goodnotes workstation will assist student learning outside of the classroom, offering the autonomy of choosing a variety of annotation styles and of managing notes in folders and through file-sharing programs. These activities solidify important concepts from the textbook by engaging students or teams of students in the steps of acquiring, annotating, and discussing musical form, style, and function in the context of their readings.